Glamorgan's home ground will host four group matches at the ICC Men's Cricket World Cup 2019. 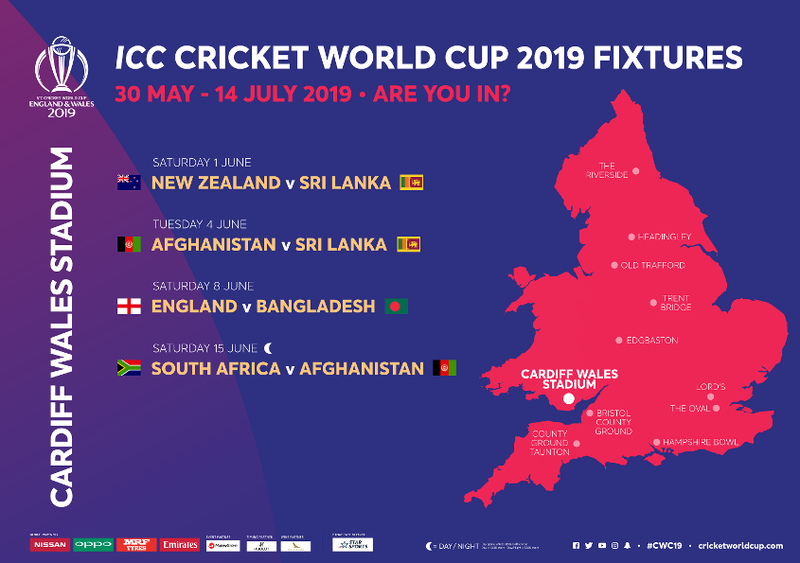 At the ICC Cricket World Cup 2019, the Cardiff Wales Stadium – home of Glamorgan County Cricket Club - will host four fixtures, adding to the sole World Cup game played there in 1999. To find out more about the accessible facilities and services at the Cardiff Wales Stadium, check out the CWC19 Access Guide here. Plan ahead so you can make the most out of your day at the Cardiff Wales Stadium during the ICC Men’s Cricket World Cup 2019. Cardiff Wales Stadium sits within Sophia Gardens and there are plenty of public transport options if you want to leave the car at home. Cardiff Central Station in the city centre is the main train station for Cardiff. It operates local services across Wales and regular high-speed trains between Cardiff and major towns and cities including London, Bristol, Birmingham and Swansea. For information about train times please visit www.nationalrail.co.uk. The walk to the ground along the banks of the River Taff and through Bute Park takes approximately 20 minutes. There will be World Cup Cricketeers along the route to help answer any questions and guide you to the ground. A Park & Ride service will operate on all matchdays from Cardiff City FC Stadium, postcode: CF11 8EG. It is a 15-minute bus journey and costs £15 per vehicle, which includes the shuttle directly to/from the ground. The car park opens three hours before the first ball and the bus service to the ground starts 2.5 hours before. It will run intermittently until 30 minutes after the first ball. The shuttle will then start from the ground one hour before the final ball. Cardiff and the Sophia Gardens area are well serviced by the local bus network, with regular services between the city and Cathedral Road (adjacent to Sophia Gardens). The majority of the public transport buses in Cardiff are accessible and drop off close to the venue on Cathedral Road. If you would like more information or are planning your journey, please visit www.travelinecymru.info. Location and costs for those travelling by private coach will be available soon. There is limited parking next to the ground, which is pre-bookable only and will not accept on-the-day vehicles. The cost to park here is £15 per vehicle, to book please contact the venue directly on 02920 409380 or email info@glamorgancricket.co.uk. If you are driving it is recommended to use the Park & Ride service or use one of the public car parks in and around the city centre. Please see www.cardiff.gov.uk for more information on parking locations and prices. There is blue badge parking at the venue, which will need to be booked in advance by contacting the venue directly on 02920 409380 or email info@glamorgancricket.co.uk. It is recommended to be parked 60 minutes before the first ball and will need to stay in place until 30 minutes after the final ball for safety measures. Uber operates and is available in Cardiff. If you are local to the area, walking is a great way to get around. Cardiff Wales Stadium is a short walk from the city centre through Bute Park. World Cup Cricketeers will be along the route to help answer any questions and guide you to the ground! If you choose to cycle to the match there are publicly available bike racks in the city centre and the Sophia Gardens area. Cardiff is a port city located on the South Wales coast. In the 19th century, the industrial revolution turned a relatively small town into one of the world’s busiest ports, exporting Welsh coal across the globe. City status was granted in 1905 and Cardiff was made the official capital of Wales in 1955. Cardiff today, with a population of just over 360,000, is the nation’s largest metropolis and the fastest growing urban area in the UK outside of London. Over the past 25 years the city has undergone a major transformation. In the late 1990s, a multimillion-pound regeneration project revitalised the former docklands into a stunning waterfront. 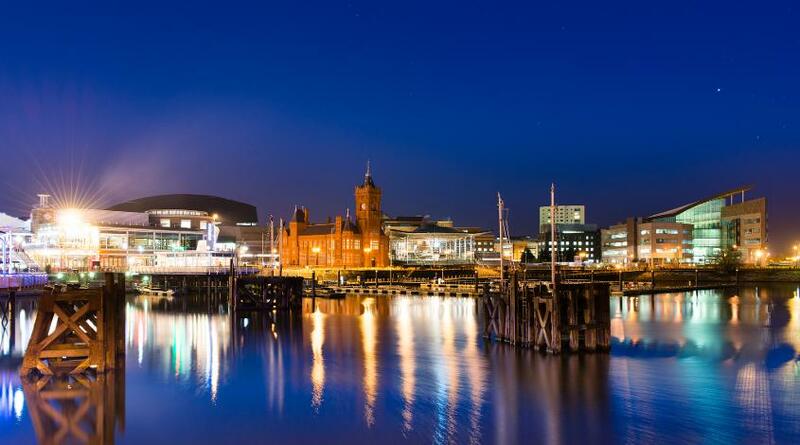 The area, known as Cardiff Bay, has a variety of modern restaurants and bars and houses some of Cardiff’s most culturally significant and beautiful buildings, including Wales Millennium Centre and the Senedd (the headquarters of the Welsh Assembly Government). Visitors exploring the bustling city centre can enjoy unique attractions, quirky shopping arcades and a growing café culture, all against the backdrop of two iconic and contrasting venues - Cardiff Castle and the Millennium Stadium. Cardiff has more green space per person than any other UK core city. You can walk to the Cardiff Wales Stadium through one of the largest parks - Bute Park next to Cardiff Castle. Wales has its own language? Why not try? Croeso, pronounced Kroyso, means welcome!